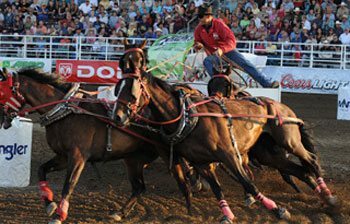 Day 7 was another perfect day at Stampede Park and saw 3-time Calgary Stampede sudden death finalist Rick Fraser, driving the Heninger Toyota / Chickwagon! Foundation for Women outfit posted the top time of the night with a 1:15.08. Coming off barrel number 1 in heat number 9, Fraser won his second day money for the week by 16 one-hundreds of a second over yesterday’s day money winner Brian Laboucane. Kelly Sutherland, Jerry Bremner and Kirk Sutherland rounded out the top 5 for the night. Neal Walgenbach continues to hold onto the lead the overall aggregate with a 6 day aggregate time of 7:43.80. He is followed closely by 3-time Calgary Stampede champion Buddy Bensmiller with Jason Glass, Kirk Sutherland, Kelly Sutherland, Rick Fraser, Gary Gorst, and Mark Sutherland making out the top after five runs.